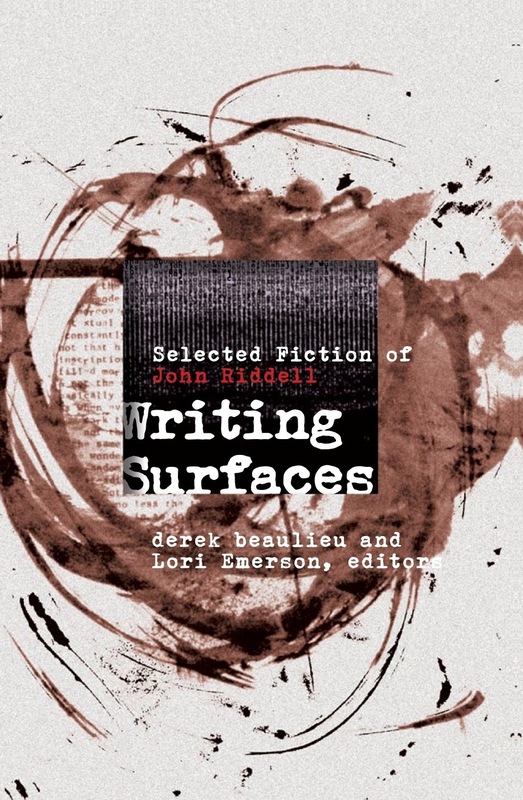 Below is the introduction that Derek Beaulieu and I wrote for Writing Surfaces: Selected Fiction of John Riddell that Wilfrid Laurier University Press published in April 2013. Writing Surfaces: The Fiction of John Riddell reflects Riddell’s participation in these Toronto-based, Marshall McLuhan-influenced, experimental poetry communities from the 1960s until roughly the mid- to late-1980s. These communities, and the work of contemporaries bpNichol, Paul Dutton, jwcurry, Richard Truhlar and Steve McCaffery, give context to Riddell’s literary practice and his focus on ”pataphysics, philosophically-investigative prose and process-driven visual fiction. While many of his colleagues were more renowned for their poetic and sound-based investigations, Riddell clearly shared both Nichol’s fondness for the doubleness of the visual-verbal pun and Steve McCaffery’s technical virtuosity and philosophical sophistication. In his magazine publications, small press ephemera, and trade publications, Riddell created a conversation between these two sets of poetics and extended it to the realm of fiction (exploring a truly hybrid form that is poetry as much as it is fiction). Riddell’s work as fiction works to explore the development and accretion of narrative in time-based sequence, a fiction of visuality and media. Writing Surfaces is the documentation of Riddell pushing his own writing to the very limit of what conceivably counts as writing through writing. While it’s true that the title “writing surfaces” carries with it the doubling and reversibility of noun and verb, reminding us how the page is as much a flat canvas for visual expression as it is a container for thought, the first title we proposed for this collection was “Media Studies.” The latter, while admittedly too academic-sounding to describe writing as visually and conceptually alive as Riddell’s, could still describe Riddell’s entire oeuvre; the term not only refers to the study of everyday media (such as television, radio, the digital computer and so on) but it can—in fact should—encompass the study of textual media and the ways in which writing engages with how it is shaped and defined by mediating technologies. In other words, Riddell’s work is a kind of textbook for the study of media through writing, or, the writing of writing. With a/z does it (1988), Riddell’s writing of writing focuses even more on the investigation of the possibilities of story that lie well beyond the form of the sentence, paragraph, the narrative arc. Rather than playing with the visual story structure of the frame and the verbal structure of the anagram as means by which to create a narrative, with pieces like “placid/special” Riddell first creates grid-like structures of text with the mono-spaced typewriter font and then uses a photocopier to document the movement of the text in waves across the glass bed. The resultant text is the visual equivalent of his earlier fine-tuned probing of the line between sense and nonsense in “Pope Leo.” These typewriter/photocopier pieces record both signal and noise as columns of text waver in and out of legibility. Semantically, these mirage-like texts focus on the words ‘placid’ (the lines of text reminding us of the symmetrical reversibility of ‘p’ and ‘d’ which begin and end the word), ‘love’ (with just the slightest suggestion of ‘velo’ at the beginning and end of each wave), ‘first,’ ‘i met,’ ‘special,’ ‘evening’ and ‘light’ (appearing as a hazy sunset moving down the page), and conclude with ‘relax’ and ‘enjoy.’ The paratactical juxtaposition of the two pages in “placid/special” creates the barest suggestion of a narrative about lovers enjoying an evening together while at the same time each page is in itself an even more minimalist story told through experiments with the manipulation of writing media. Riddell’s writing of writing that is simultaneously sense and nonsense, verbal and visual, self-contained and serial—that demands to be read at the same time as it ought to be viewed—nearly reaches its zenith in later work such as E clips E (1989). In particular, “surveys” is writing only in the most technical sense with its Jackson Pollock-like paint drippings and scattered individual letters, all counter-balanced by neat, hand-drawn frames. Just as Riddell’s compositions challenge how writers and readers form meaning, the original publications of many of the selections in Writing Surfaces, and Riddell’s larger oeuvre, were also physically constructed in a way that would demand reader participation. Riddell’s original publications include small press leaflets (Pope Leo, El ELoPE: A Tragedy in Four Letters), business card-sized broadsides (“spring”), chapbooks (A Hole in the Head and Traces) and pamphlets (How to Grow Your Own Light Bulbs). His work also extends into books as non-books: posters which double as dart boards (1987’s d’Art Board), novels arranged as packages of cigarettes (1996’s Smokes: a novel mystery) and decks of cards to be shuffled, played and processually read (1981’s War (Words at Roar), Vol.1: s/word/s games and others). Inside books with otherwise traditional appearances Riddell insists that his readers reject passive reception of writing in favour of a more active role. While outside of the purview of Writing Surfaces, 1996’s How to Grow Your Own Light Bulbs includes texts that must be excised and re-assembled (“Peace Puzzle”); burnt with a match (“Burnout!”); and written by the reader (“Nightmare Hotel”). Copies of the second edition of Riddell’s chapbook TRACES (1991) include a piece of mirrored foil to read the otherwise illegible text. Riddell’s compositions do not just question the traditional role of the author; they attempt to annihate it. With “a shredded text” (1989) Riddell fed an original poem into a shredder, which then read the text and excreted (as writing) the waste material of that consumption. The act of machinistic consumption creates a new poem—the original was simply the material for the creation and documentation of the final piece. With “a shredded text” Riddell acts as editor to restrict the amount of waste that enters the manuscript of the book. The machine-author becomes a reader and writer of excess and non-meaning-based texts while the human-author becomes the voice of restraint and reason attempting to limit the presentation of continuous waste-production as writing. If, as Barthes argues, “to read […] is a labour of language. To read is to find meanings,” then the consumption and expulsion of texts by machines such as photocopiers and shredders produces meanings where meanings are not expected by fracturing the text at the level of creation and consumption—an act which is simultaneously both readerly and writerly. Riddell’s oeuvre is almost entirely out of print and unavailable except on the rare book market. Working within the purview of 1970s and 1980s Canadian small presses means that Riddell’s writing proves elusive to a generation of readers who have come of literary age after the demise of such once-vital publishers such as Aya Press (which was renamed The Mercury Press in 1990 and has also ceased publishing), Underwhich Editions, Ganglia, grOnk and the original Coach House Press. As obscure as his original books may be, Riddell’s work remains a captivating example of hypothetical prose; dreamt narratives that have sprouted from our abandoned machines. With no words and no semantic content, we are left to read only the process of writing made product—a textbook of compositional method using writing media from the pen/pencil, the sheet of paper, the typewriter, the shredder, photocopier, to even the paintbrush. The medium is the message.